How to Protect USB/Pendrive with Password- Here in this article we know about how to protect USB/pen drive with password and how can we give such protection with different types of software. Now a days every one use flash drives to transfer data from one computer to another computer because every flash drive is same in size but have capability of carrying GB’s of data. We use USB flash drives to boot into windows computer and play songs in DVD players. We also carry some important data through flash drives like office files and some other confidential information. Let’s assume if someone try to theft your pen drive, price is not a problem but data is more important. With the passage of time in the present era, USB (Universal Serial Bus) or Pen Drive has become one of the most efficient ways of data storage. Seems like these days, Compact Disk and Digital Versatile Disk are of no major use. Today, Global Pen Drive Market 2018-2025 report has been officially released. It clearly suggests that whopping shareholders of Pen Drive or USB drive industry are – Kingston, SanDisk, Toshiba, Netac, Aigo, TECLAST and HP. Major categories in which Pen Drives available in these days storage space wise or ROM wise are – 8 GB, 16 GB, 32 GB and 64 GB. So to prevent your important data from others you need to set some protection which is not easy to break. Here we provide some third-party applications which are good at protecting USB flash drives with password. USB Security is a great software to protect your data which is located on USB flash drive. They provide better security to your pen drive which is not easy to get data from USB drive without entering password. This is a shareware application but it works well with all functions for 30 days. After that you need to buy full license to use application without any problem. How to Use USB Security on USB Drive? 1. First you need to download latest version of USB security from the below website. 2. After that open USB security application and click on accept button to start installation. Once you click on accept button it will show all available removal drives in your pc. 3. 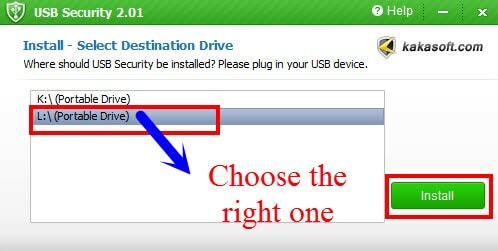 Choose your USB drive from the list and click on install button, after that click on finish button to complete the installation. 4. Now you’ll see another window which have some sort options related to pen drive protection. It asks you to set new password to pen drive and again type the same password in next field. Type some hint to remember password when you forgot password. 5. Make sure to check whether password in uppercase or lowercase. 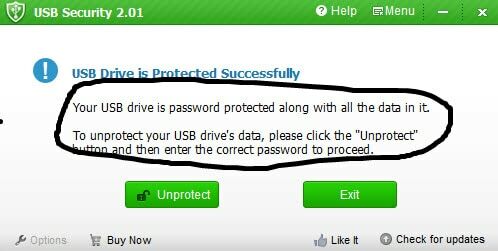 Once completing the setup click on protect button to protect data in pen drive. 6. Now it copies whole data into a secret partition and lock it with password. To get data from pen drive you need to run USBsecurity.exe file from USB flash drive and enter password to unlock pendrive. Q. How Can I get my Data Back if someone delete USBsecurity.exe? A. There is no need to worry about this because it is a one minute process. Simply copy the USBsecurity.exe file and paste it into pen drive. Now again click on USBsecurity.exe and enter password to unlock pen drive. Q. If I don’t have USBsecurity.exe file along with me then how can I get my data back? A. Don’t worry, we have solution for that problem also. Simple go through the above download link and download USBsecurity.exe file then paste it into your pendrive. Now open that exe file to unlock your pendrive. How to Uninstall USB Security.exe Completely from Your Pendrive? Normal program uninstallation process doesn’t work with this application because it doesn’t install on PC, it installs on USB drive. So before uninstalling this application you need to unprotect this application. After that it shows two options. Those are Uninstall and Reprotect. Click on Uninstall button then it prompts another dialogue box with a message “Are you sure you want to uninstall USB Security”. 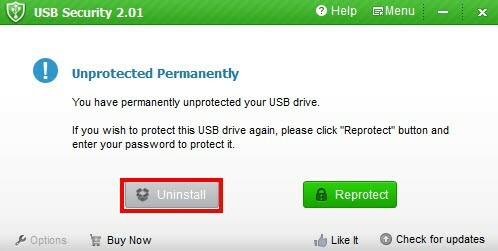 Click on OK button to uninstall USB Security completely. Is there any alternatives available for this software? By using these all tools you can protect your flash drive with password or encrypt whole data in the pendrive. If you have any doubts while installing this application please leave a message. 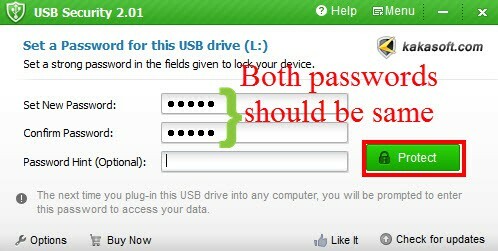 For any further questions related to How to Protect USB/Pendrive with Password, please comment below.